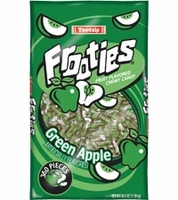 Tootsie green apple frooties are a chewy bite size candy with a great apple flavor. These have a green apple flavor making them a little bit tangy. Frooties are available in many flavors. Try them all Strawberry,Blue Raspberry,Grape, Fruit Punch, Strawberry Lemonade, Cran Blueberry and Watermelon. No matter what your taste buds are begging for you will find a flavor to please it.